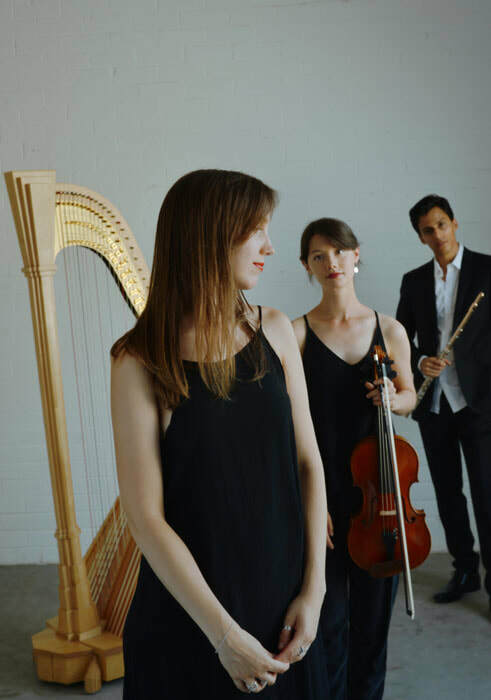 The Chrysalis Trio are an Australian-based classical chamber music group, consisting of Katie Yap (viola), Kiran Phatak (flute) and Melina van Leeuwen (harp). ​ Formed in 2013 by three students at the Australian National Academy of Music (ANAM), the Chrysalis Trio has gone on to be one of Melbourne's most exciting young ensembles. Brought together by the seminal piece for the ensemble, the Debussy Sonata, they quickly found in each other musical and personal kindred spirits. Their name draws inspiration from their shared love of nature, and their time spent in the Royal Botanic Gardens in Melbourne, where they would take breaks from intensive rehearsals at ANAM and discuss music, nature, history and philosophy. While studying, they were finalists in both the 2013 and 2014 ANAM Chamber Music Competition, recorded by 3MBS, and were featured performers at the 2014 World Harp Congress. Since then, they've been performing creatively curated concerts around Melbourne, and have been invited to play in events such as the City of Mooney Valley Winter Arts Series and innovative classical-meets-electronic series, Play On, in 2018.